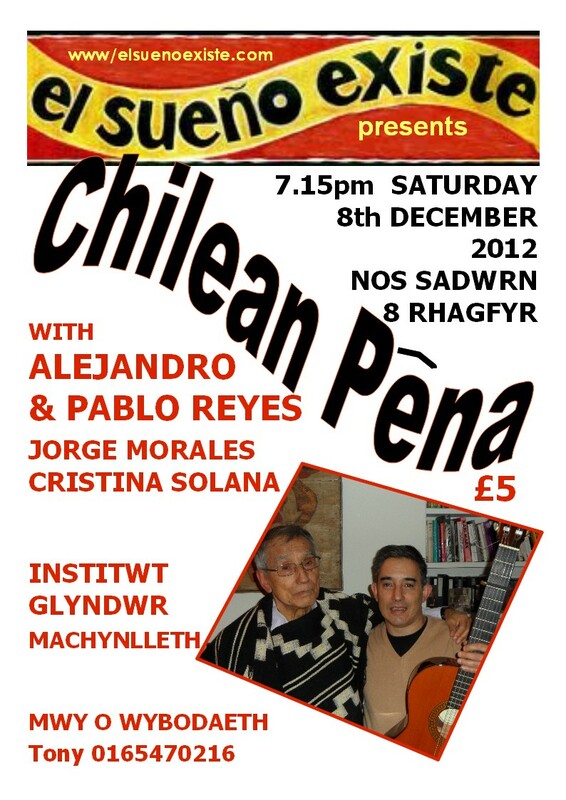 A heart-warming evening of Chilean folk music took place at the Glyndwr Institute in Machynlleth on Sat 8th December 2012. Chilean musician Alejandro Reyes was accompanied by his son Pablo, playing the unusual and haunting rhythms of the Chilean countryside. Alejandro was a member of legendary Chilean band Cuncumen together with the great Victor Jara. He recorded a song “Entonces Me Voy Volando” as a duet with Victor in 1958. Victor Jara was a victim of the Pinochet coup of Sept 11th 1973 and is the inspiration for the “El Sueño Existe” [The Dream Lives On] festival that takes place in Machynlleth. Alejandro taught Victor an old folk song “Una Montana Oscura” [Dark Mountain] the melody of which Victor used for the beautiful song “El Cigarito”. Wonderful Chilean folk singer Jorge Morales presented some songs from his forthcoming CD, “Suenos De Mis Ninos” [Dreams Of My Children]. There was a short theatrical presentation by Italian, Marta Pacini and some Welsh songs from Rhiain Bebb and Helen Pendry. They also sang a song of Victor Jara’s translated into Welsh by Dafydd Iwan called “Y Hawl I Fyw Mewn Rhydd” [The Right To Live In Peace]. Cristina Solana [and co] from the Canary Islands sang some songs by Cuban folk balladeer Silvio Rodriguez.